I have admired Kurt Johannessen‘s artists’ books since Tanya Peixoto introduced me to them at bookartbookshop about 8 years ago. My absolute favourite is his little pocket book Exercises (2001)- a small book of performative texts such as ‘Kiss the wind’ or ‘Follow a snail for a day’. One of these exercises is ‘Write 100 stories and bury them in the forest’. So I did. 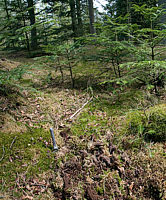 As I was going to Denmark for the Doverodde Book Art Festival in May 2010, it seemed the perfect opportunity to write my 100 short stories in an exercise book before I left and bury the book in the beautiful forest surrounding the Limfjordscentret, Doverodde where the festival is held each year. 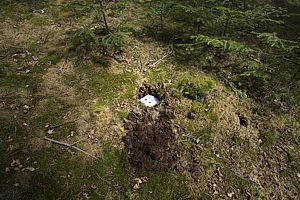 I then thought that I might be tempted to go back and dig in the same spot the following year so to make sure that didn’t happen, I gave my book and trowel to two others in our group and asked them to bury it for me but not tell me where. Thank you Paul and Simon for carrying out the burial, and Paul again for the beautiful photos of the forest where it was buried. 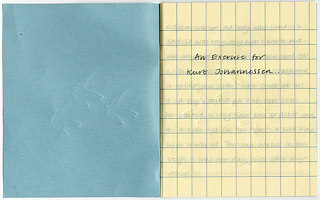 And thank you Kurt for the inspiration and permission to make my book: An Exercise for Kurt Johannessen. Download the kurtbk.pdf and set your print/page set up to landscape. Score down the middle of each page with a bonefolder. To assemble the pile of pages, start with page 1 with the cover face down, then place page 2-3 so that the image of Simon digging the hole for the book to be buried is face up, then page 4-5 so the image of the inside of the exercise book (yellow paper) is face up, then 6-7 so the double spread titles of the stories 1-68 is face up. Staple in the middle and fold all the pages over so the title is on the front page. *Sarah used recycled cream paper for the original copies.